Following up my posts on Judge Robart’s opinion in Microsoft v. Motorola and on the European Commission’s issuance of a Statement of Objections to Motorola, one of the most important questions in patent and competition law these days is what consequences, if any, should follow when the owner of a standard-essential patent (SEP) that is subject to a commitment to license the SEP on fair, reasonable, and nondiscriminatory (FRAND) terms files suit (or threatens to file suit) for the infringement of the SEP and seeks injunctive relief. Since the U.S. Supreme Court’s 2006 decision in eBay v. MercExchange, U.S. courts no longer grant prevailing patent owners injunctions as a matter of right but rather weigh the four equitable factors of irreparable harm, adequacy of remedy at law, balance of hardships, and the public interest. Both Judge Robart in Microsoft v. Motorola and Judge Posner in Apple v. Motorola have expressed the view that, under eBay and as a general rule, a commitment to license an SEP on FRAND terms means that the patent owner cannot obtain an injunction but rather must settle for damages only. Under U.S. law, those damages can be both compensatory (for past harms suffered) and prospective (for the future use of the patent). One of the questions on appeal in Apple v. Motorola is whether this view is correct. I happen to think that it is, because otherwise the risk of patent holdup is too great, though whether the Federal Circuit will agree remains to be seen.If this is the correct view, however, courts deciding such cases will have to determine how to calculate a FRAND royalty. Most likely, as in Microsoft v. Motorola, courts will determine a FRAND royalty under some version of the Georgia-Pacific willing licensor/willing licensee framework. As I discussed in an earlier post, I think that Judge Robart largely gets this issue right. But there are at least three subsidiary issues to consider. One relates to the question of timing—that is, as of what date should courts assume the hypothetical negotiations between the willing licensor and willing licensee to take place? The conventional articulation of Georgia-Pacific states that the hypothetical negotiations occur as of the date the infringement begins, but as I and others have argued in the FRAND context the literal application of this time frame would not avoid the holdup problem where the defendant began using the patented invention after the standard was adopted. In such cases, economic considerations suggest that to avoid holdup the correct date should be the date on which the standard was adopted. I am hopeful that the Federal Circuit will agree if it chooses to address this issue in Apple v. Motorola. A second issue is whether, as in the conventional application of Georgia-Pacific, courts should try to reconstruct the royalty the parties would have agreed to, ex ante, on the assumption that the patent was valid and infringed. Again, I argued in my post on Microsoft v. Motorola that in an infringement trial it is economically correct to indulge this counterintuitive assumption in order to avoid a double discounting problem. However, if a court is trying to reconstruct the royalty outside the context of an infringement action, as in Microsoft v. Motorola itself, it is correct to do as Judge Robart did and consider the probability of validity and infringement as relevant factors in determining the licensing rate. In other words, a FRAND rate decided pre-patent infringement litigation should be lower than a FRAND rate involving the same patent decided after patent infringement litigation. Again, some may disagree with me on this, and the result may seem counterintuitive, but I think the analysis is generally sound. A third issue is whether the FRAND rate for the prospective use of the patent should be increased further yet. In the post-eBay cases in which U.S. courts have awarded prospective royalties, the Federal Circuit has held that as a general matter the answer is yes, because postjudgment the bargaining position of the parties has changed in favor of the patentee. Both Mark Lemley and I have argued that this is economic nonsense—the rate should be the same for both pre- and postjudgment royalties—but, for now at least, the rule is what it is. Nevertheless, I hold out hope that at least in the FRAND context the Federal Circuit will be willing to make an exception, because where the patentee has committed to accept a FRAND royalty a court should not impose what amounts to a super-FRAND royalty for the post-judgment use of the same patent. In other countries, injunctive relief still often remains the presumptive remedy for patent infringement—though it is interesting to speculate whether this will remain the case indefinitely. In Europe, for example, article 12 of the EC’s 2004 Enforcement Directive states that members “may provide that, in appropriate cases,” courts may order, in lieu of an injunction, “pecuniary compensation to be paid to the injured party instead of applying the measures provided for in this section if that person acted unintentionally and without negligence, if execution . . . would cause . . . disproportionate harm and if pecuniary compensation . . . appears reasonably satisfactory.” Over the years, there have been a handful of decisions in the U.K. (and at least one in Canada) in which courts have denied prevailing patent owners injunctive relief; and last year, the English Patent Court decided to deny a permanent injunction in an infringement action brought by IPCom against Nokia, reportedly on the ground that the patent in suit was standard-essential. In addition, as I discuss in my book, based on some limited case law and a 2008 speech by Supreme People’s Court Justice Cao Jianming, there also is reason to believe that Chinese courts have discretion to deny injunctive relief in appropriate cases. On the other hand, and notwithstanding the EC Enforcement Directive cited above, courts in Continental Europe still generally appear to view injunctive relief as more or less an entitlement. With respect to standard-essential patents in particular, however, in the 2009 Orange-Book-Standard case the German Bundesgerichtshof (BGH) (Federal Supreme Court) held that competition law could sometimes obligate the owner of a standard-essential patent to license the patent on FRAND terms. More specifically, an infringer may not be enjoined if it proves, first, that it “made an offer, ready for acceptance, on contractual conditions, which the patent holder cannot refuse without thereby treating the party seeking a license unequally without good cause as compared with similar enterprises or impeding him inequitably” in violation of German competition law, which forbids a “market-dominant patent holder” from abusing its market-dominant position by refusing “to conclude a contract offered to him on non-obstructive and non-discriminatory terms.” Second, the infringer must “behave[ ] as if the patent holder had already accepted his offer” by paying “the consideration that the licensee would be obliged to pay according to a non-discriminatory or non-obstructive licence contract.” BGH May 6, 2009, GRUR INT. 747, 2009 (Ger. ), English translation available at 41 IIC 369-75 (2010). Under this approach, competition law may provide a means for avoiding a permanent injunction in some class of cases, though hardly in all cases involving SEPs; indeed, in practice so far, it would appear to be the rare case that satisfies Orange-Book-Standard.Anyway, in March 2013, a German court in Duesseldorf referred to the Court of Justice for the European Union (CJEU) the question of whether it is an abuse of dominant position for the owner of an SEP who has made a FRAND commitment to seek an injunction (for discussion, see here); and the same issue may come up in connection with the E.C.’s Statements of Objections against Motorola and an earlier one directed against Samsung. So it’s possible that Orange-Book-Standard will not be the last word on the issue. The broader question is whether it is preferable to decide such issues as a matter of patent law or as a matter of competition (antitrust) law. There may be pros and cons to either approach, and the answer must depend in part on the content of competition law; the European concept of abuse of dominant position has no precise corollary in the U.S. My own view is that the eBay approach makes sense in that it enables courts to decide whether injunctive relief is appropriate or not on a case-by-case basis, without inquiring into whether competition law also applies to the matter; at the same time, it would not preclude the application of competition law if and when appropriate. I hope to write about these issues in greater depth in a forthcoming paper. But it will be interesting to see how the law evolves with respect to these issues in the coming years. On March 16, 2013, the United States changes from a “first to invent” country to a “first inventor to file” country for patent applications. Patent “trolls” or “non-practicing entities” (NPEs) own patents but do not make, use or sell the patented product. Instead, patent trolls have in the past generally followed a business model in which, under the threat of patent litigation, they demand and receive relatively small amounts of revenue from a large number of targets. Each of the targets believes that it is in its best interest to pay the troll a relatively small licensing fee for use of the patent rather than face the possibility of huge, uncertain damages in a patent infringement lawsuit. By owning a large number of patents, a patent troll can have a large potential market. However, section 299 of the AIA, effective as of September 15, 2011, limits the ability of patent trolls to join large numbers of accused infringers in a single patent infringement suit. Thus, the AIA section 299 may drastically change the traditional litigation business strategy used by patent trolls. However, the AIA also opens up a potential new, non-litigation business strategy for patent trolls. A picture is worth a thousand words. Take a look at the following example in which B is a patent troll that owns invention B and A is a target company which owns invention A. 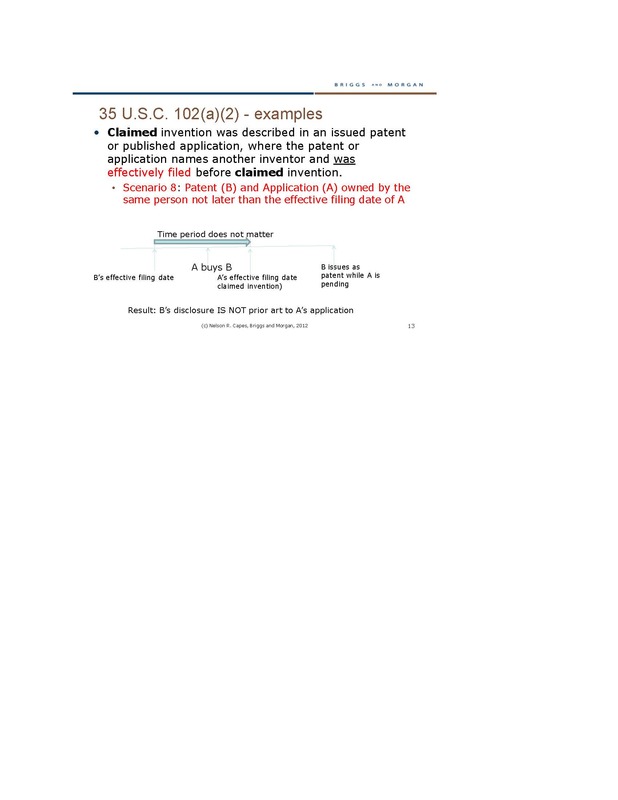 Under the AIA, as cited above, if B’s effective filing date is earlier than A’s effective filing date, B will be prior art to A and the disclosure in B may prevent patent A from issuing. However, this result can be avoided if A owns invention B “not later than the effective filing date” of invention A. On or after March 16, 2013 an issued patent or pending patent application that would be prior art to a new application has potential value to the applicant for a new patent. Thus, the date of March 16 can be a “bridge” between the troll’s patent or application having no value to target A and a value that may be large, depending on the significance of the target’s new patent application and the presence/absence of other prior art. If company A believes that invention A is key to its business, company A may be willing to buy application B at a significant price. However, if there is other prior art, company A may only be willing to pay the troll less money for application B. This strategy has the disadvantage that (probably) the patent troll can only use it against one target at a time, because the troll is selling the leveraging patent, not licensing it to many targets. However, if section 299 of the AIA has the predicted deterrent effect on the joinder of multiple defendants, the strategy may be the only one left to the patent troll. Note that this strategy will not work before March 16, 2013. Before that date, company A may be able to “swear behind” the filing date of invention B under 37 CFR 1.131 by establishing by oath or declaration that the subject matter of invention A was invented prior to the effective date of invention B. Therefore, it is prudent for company A to file a patent application for invention A prior to March 16, 2013, particularly if it is aware of invention B. By doing this, company A cuts off the troll’s potential market for invention B.